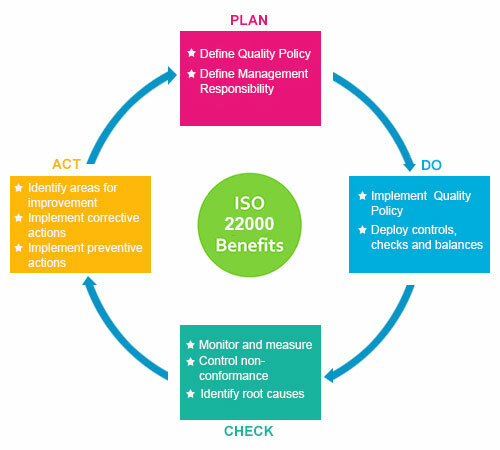 ISO 22000:2005 is the first international Quality Management and Food Safety System that replaces HACCP, in food supply chain and is valid for all kind of food enterprises and organisms that participate in the food supply chain, handling all potential dangers of foods safety. IFS and BRC Food Safety and Quality Management Systems, are more specialised, detailed and demanding standards than that of ISO 22000, and they are applied mainly in enterprises that are interested to export their products in the United Kingdom, America and in other European countries that follow and require from their suppliers implementation of the specific Quality Systems. Our company has the required experience in IFS and BRC food safety systems, in their preparation, as well as in their implementation in food industry. Also, the WHO-FAO HACCP System Codex Alimentarius, sets the basic parameters for the correct implementation of Safety and Quality in terms of preparation, production ,package, storage, distribution of foods. 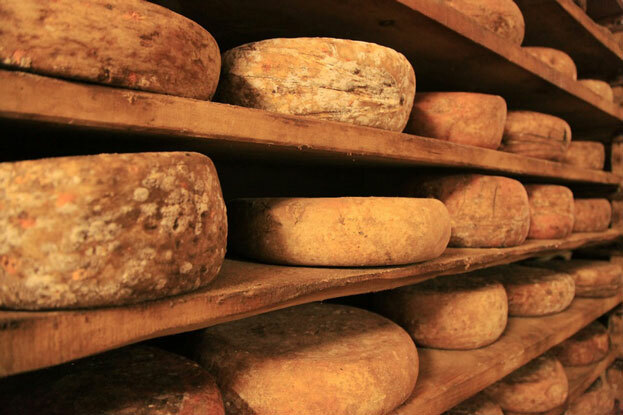 Codex Alimentarius certificate is not enough in most authorities, however constitutes a solid proof of real interest of small enterprise that is related with the Chain of Foods, for the observation of Equitable Rules of Practical Safety of Foods, as HACCP. Marketing/Sale of Foods and Drinks. Enterprises/Organisms which wish they ensure the quality and reliability of suppliers and their collaborators, but also their attendance in commercial, services and not only to the chain in which they participate. Enterprises/Organisms which wish the acquisition of advantages (e.g. advertising) against their commercial competition. Enterprises/Organisms which wish to participate in various competitions, with prerequisite the existence of such a Quality Management System in their company. Enterprises/Organisms that are interested for the optimisation and their continuous improvement. 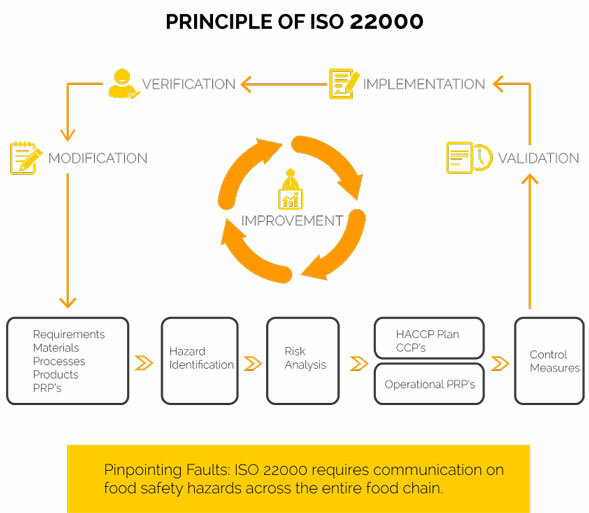 These objectives are achieved with the total providence for the Management of Quality which it lends ISO 22000:2005, that brings as resulting from the successful analysis and prevention of by any chance undesirable dangers of foodstuff safety, but also their achieved confrontation, when these happen, with the aid of involved traceability system records and processes that are applied by each enterprise. In conclusion, ISO 22000:2005 applies to all kind of enterprises and organisms that are related with the foods and drink industry and it constitutes a functional and most excellent administrative and organisational tool. Improvement of services and/or products of enterprise or organism. Improvement of processes of management and the control of internal processes of enterprise of/organism. Improvement and guarantee of equitable internal communication of enterprise/organism. Improvement and guarantee of equitable exterior communication of enterprise of/organism with the suppliers/customers/public and private organisms it collaborates with. Economic improvement and increase of effectiveness and productivity of enterprise of/organism. Total improvement of the general picture and effectiveness of the enterprise or/organism. It is worldwide acceptable and recognisable standard. It creates confidence for the quality of products and services in the consumers and all other interested parties. It provides conformity compliance with the legislative requirements and the agreed requirements of collaborators /customers. Deposit of an offer for the total study and implementation of the Quality Management System and its follow-up process of Certification. Our Company undertakes the study and implementation of Food Safety and Management Quality Systems such as ISO 22000:2005,that handles the total management of your enterprise or organism. Also our company undertakes all necessary consulting assistance until your final certification, such as your complete support before and afterwards Implementation of your own system, always depends on your unique requirements, taking into consideration the most excellent quality and the most excellent result with the smaller possible interventions in the operation of your company/organism, offering you consulting services in legislation and operational level.